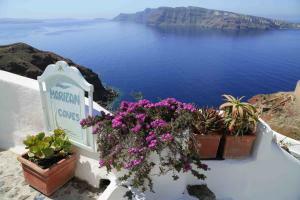 The Marizan Caves & Villas is located at the highest point of Oia, right on the edge of the famous caldera. 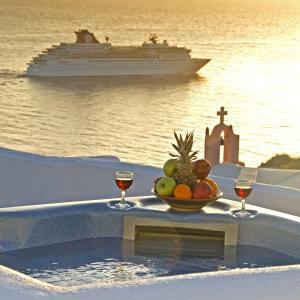 It offers views of the sunset and the Aegean Sea from a height of over 200 meters. Traditional cave style room. It offers unique views of the caldera and the sunset. This cave-style room combines traditional and modern architecture. It offers a private balcony with unique views of the caldera and the sunset. This cave house has magnificent views of the volcano and the caldera, TV, air conditioning, refrigerator and basic kitchen utensils. This villa has magnificent views of the volcano and the caldera, TV, air conditioning, refrigerator and basic kitchen utensils. This cave has magnificent views of the volcano and the caldera, TV, air conditioning, refrigerator and basic kitchen utensils. This cave room has magnificent views of the volcano and the caldera, an outdoor hot tub, a TV, air conditioning, a fridge and basic kitchenware.